Welcome to another Seize The birthday! The optional topping for this challenge is Coffee or Tea, but you can always play along with any birthday-themed project. For my card I've used a few of my stamps: Brew-tiful Day, And Coffee and the sentiment from Classic Shoes. Pop on over to the Seize The Birthday blog for some more fabulous inspiration from the design team, and our surprise party guest, Kristie Goulet, and then play along with us. Great coffee card for a birthday!So retro and CAS. Shirley I love this! The cup is so graphic and the background is so awesome for this challenge! Love the sentiment-stamped background and the gorgeous coffee cup. Such a great card! Such an awesome card! And an even more awesome coffee cup! Its just beautiful! Love your card! I can't imagine what it would be like to say " Some of MY STAMPS"! So happy for you and your card is FABULOUS!!! Once again, I am loving the way you colored!! Great background for your fun coffee cup. Love your card. 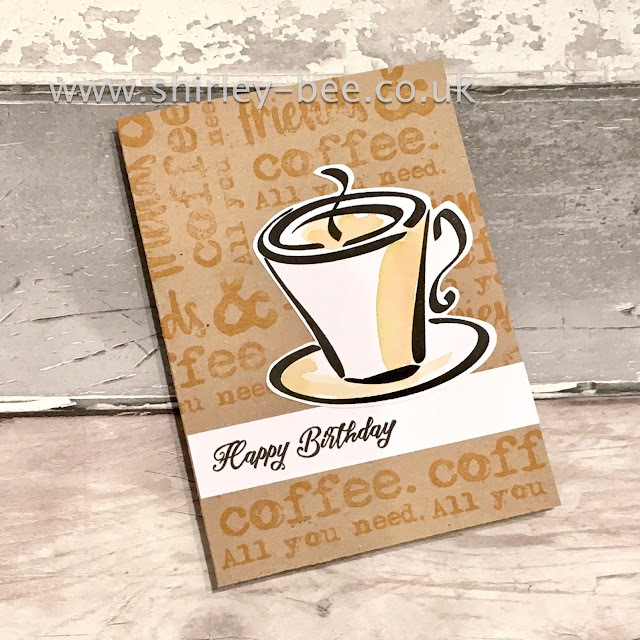 What a fabulous coffee themed birthday card!!! Love the fun stamping on the background!!! This is just so fantastic. Love the bold, graphic design and the perfect mix of neutrals.